In the context of television, I remember when the word “snow” meant that you had very poor reception. Under those conditions, the image on the screen looked like a snowstorm. Now, however, there is a whole new type of “snowstorm” hitting TV and this one is causing a MUCH more profound effect. In the past few weeks, I have seen a veritable storm of news showing how the “Snowflake Effect” (mass personalization) is deeply affecting TV. Today I’m pointing out some examples to help bring the underlying pattern of the Snowflake Effect into focus, and so we can all understand and benefit from this in our current work and planning. In my role as the so-called “Strategic Futurist”, I strive to look much further into the future than is typical. Taking the long view helps all of us make smarter decisions NOW! This approach is more than just fanciful gazing into the future, and it is not purely strategic. Rather it is a very pragmatic and smart approach for providing good “decision support” for our everyday actions, choices, and guidance. By seizing the underlying principles and patterns, we can make significant advances toward mass personalization and a world optimized for each of us as unique individuals experiencing a stream of unique moments and opportunities. So with this purpose in mind, here are some new directions in TV content—some concrete evidence of extremely telling and important trends that will affect our overall collections of content and our abilities to get content “just right” for each of us as “snowflakes” and for each “snowflake” moment. My first example illustrates the convergence of TV and video from multiple content sources. In this case, the combination of services and technology enables the mass personalization of TV viewing with personal or digital video recorders (PVR or DVR) along with the videos available from online outlets such as Amazon. “A Hands-On Look at Amazon Unbox on TiVo” by Matthew Moskovciak on Crave. As these reviewers note, this first offering exhibits many of the shortcomings that most innovations suffer from, such as some awkward interface problems and difficulties displaying wide-screen HD content, but they will surely be addressed as they mature. The Unbox also provides a significant advantage over say, the recent Apple TV or the use of Microsoft Media Centers, because you don’t need a PC running in the background to make this all work. So this solution is a significant step towards making mass personalization of TV content much simpler and more likely to be adopted by the masses. It’s a great example of TV’s transition from a medium to content, something I discussed previously here at Off Course – On Target with “The Old Medium has become the New Content” Part 1 and Part 2 . TiVo also recently rolled out another and perhaps even more significant capability called “TiVo Home Movie Sharing”. By providing you with a “private channel, this service lets you quickly and easily share your own video content (home movies) with other TiVo users. To provide this new service, TiVo joined forces with One True Media, an online service that helps people create video montages or home movies and provides a fast way of uploading your own content. Thomas Hawk’s Digital Connection has a more detailed review entitled “TiVo Home Movie Sharing”. Obviously this model is limited to those who are TiVo users, but look beyond this and imagine what will happen as this capability becomes more ubiquitous and universally available! And of course, there would be no need to restrict this to “home movies” since it would work equally as well to share video content of any kind and would have value for businesses, education, and most organizations. This example may help you understand some of my previous comments about the exponential explosion of “channels” for content (such as music and video). 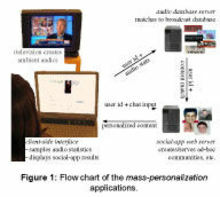 From the hundreds of channels currently available via cable and satellite to literally billions of personal channels, there would be at least as many, if not multiple, channels as people since each individual would want to have many different channels to match many different moods, situations and circumstances—watching alone versus with your family, daytime versus nighttime, news and documentaries versus entertainment, etc. Google has also announced several new initiatives that provide further proof of this trend towards mass personalization of TV and video content. For example, in a continuation of their basic ad-based business model, Google recently entered the television advertising business by striking a deal with the large U.S. satellite TV operator EchoStar. Reuters covered the story in the PC Magazine article “Google Ads Move Onto Direct TV”. I am NOT pointing this out because of the advertising or business model issues, but because this is all being driven by the desire to get more direct connections with viewers and to provide the critical feedback loop component of the Snowflake Effect. As the PC Magazine article notes, “Viewer feedback is the Holy Grail”. Granted, this is also being driven of course by advertising revenue and the pursuit of personalization of advertising, which can certainly have its dark side. However there is also the significant upside of developing these capabilities for improved “targeting” of information and there is no need for this to be restricted to advertising content or purposes. When it works to our own advantage and benefit, well “targeted” information is simply another example of getting it “just right” as in just the right information to just the right person(s) at just the right time, etc. And as noted in my previous post “JOOST = Juiced TV”, such targeted advertising has the ability to dramatically reduce the volume of advertising we experience by as much as 90%! Of course, this is not a new capability, since many other manufacturers and service providers have been offering this for several years. But Apple hopes to be able to do for TV and video content what it did for music and audio content with the iPod. In fact, Apple TV requires the use of iTunes (running on a PC or Mac) to control the access to video and TV content. Personally I think this is also one of the more vexing limitations of the Apple model including the fact that a computer running iTunes is also required to make the system work. I was also surprised to find that there is currently no way to buy iTunes Store content directly from the Apple TV. You have to go to your PC or Mac to do this. This is why the Amazon/TiVo Unbox example is a potentially better model. But it would be folly to dismiss the “Apple factor” with the “emotional design”, mass appeal, and marketing that Apple is SO good at delivering. Some see all this recent activity around television as the “liberation of the living room”, which I agree is happening. However, I think this is missing the much larger trends—the transition of TV from an old medium to the new content, and the progression of mass personalization or the Snowflake Effect. Now THAT is a snowstorm I want to be a part of! I’m looking forward to hearing about other examples from you, as well as your observations and reflections after you’ve experienced some of these yourself. Put on your snowshoes and let’s start walking this talk. Very interesting article. I really need to get a satellite. Great post! I really like this post because it focuses on the subject and it really provides useful information that you can really take advantage of. This by far is the most interesting information about the Severe Snowstorms Hitting TV that I have ever read. Another thing I like it goes to the point without wasting my precious time. but the 2006's winter was the hardest for me. What kind of person thinks about his snow shoes ? Very interesting reviews, thanks for the sites! these kinds of shoes reminds me my childhood. awesome review thanks for share it! Thanks for sharing this information about Severe Snowstorms . Your blog posting is very good and theme base for which it is liking to every people. Hello friend excellent post about Get out your Snow Shoes—Severe Snowstorms Hitting TV thanks for sharing!! regarding shoes in the house. i like this part of comment: "In the context of television, I remember when the word “snow” meant that you had very poor reception. Under those conditions, the image on the screen looked like a snowstorm."" We are going to a lake theme park. There are several wet and dry rides and I don't want blisters from my shoes (from walking in wet shoes) but I don't want to lose my shoes either (on a rollar coaster). So what do you suggest? I think this is a great idea! I am in and I will link to it in my next blog entry. I hope that will be before next Sunday! Hope you are having a good weekend! Well, I love to see snow flakes! Snow is likely for West Virginia Friday and Saturday. A big winter storm will be moving up the east coast over the weekend, providing West Virginia with snow.Winter storm warnings have been issued for the majority of the state, beginning Friday night and lasting through the early morning hours of Sunday. TV and this one is causing a MUCH more profound effect. In the past few weeks, I have seen a veritable storm of news showing how the “Snowflake Effect” (mass personalization) is deeply affecting TV. collections of content and our abilities to get content “just right” for each of us as “snowflakes” and for each “snowflake” moment. However, the smart shopper will soon realize that many of these coupon sites have expired coupons and discount codes listed, but don't be discouraged by that. With some patience, a requirement of the smart online shopper, you will be able to locate a coupon site that consistently publishes current online coupon codes and any restrictions associated with the coupons. 1Interesting Article. Hoping that you will continue posting an article having a useful information. Thanks a lot! Good reviews compel us to work more hard.And TiVo has a excellent track record. we can make significant advances toward mass personalization and a world optimized for each of us as unique individuals experiencing a stream of unique moments and opportunities. Great post I really inspired with your work that you have been done for this blog I hope that it may further improved. would like to buy them asap. wow wonderful blog. This is a good invention done here. I like this view. change your life , change yourself and change your hair style. I am a little bit short-spoken since I was very young,because I do not like talking too much ,if there is a choice,I would rather doing or talking.I don't know why.maybe this is me inborn. I am smitten by the way you addressed this topic. It is not often I come across a web site with amusing articles like yours. I will bookmark your feed to stay up to date with your hereafter updates.Just brilliant and do preserve up the complete work. Tomorrow is another day , should have new features. Thank you for your great article! It has been very insightful. I hope that you will continue posting your knowledge with us. Merry Christmas! Thank you to tell us more interesting information.So nice sharing.I great to read it . the content of this course, I may have different views, but the information you provide is very helpful for me, I always support you, yes, I have been doing. Cecile. milky? I have never known that. It means we should keep all milky wrapping paper? Definitely going to be successful. Excellent tips. The snowstorms this year have been epic! This is an amazing blog. Thanks for the help it will really be beneficial to many through this snowy season. Very nice post. I look forward to continuing my quest for good blogs to read.